San Remo Winners at the Final Grade 1 of 2018. 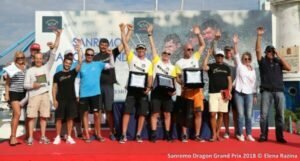 NED 412 Pieter Heerema, Lars Hendriksen & George Leonchuk win the San Remo Grand Prix. Organiser Tatiana Kurbatova (left) at Prize Giving was joined on the Podium by the top 5 teams of the final Grade 1 event of 2018 in San Remo. Proud Champions NED 412 Pieter, Lars & George (Centre) were pushed all the way by runner up GER 1207 Nicola Friesen (second right). 3rd place went to ITA 77 Yevgen Braslavets (light blue shirt), 4th was GBR 820 Grant Gordon (third left) and 5th place to RUS 76 Dmitry Samokhin (fourth left). Top Corinthians GBR 770 David & Lynne Brown & Son Jono with Gilly Hamilton. So there we have it fellow Sailors, another European Grade 1 season over. We began with February Snow in Cannes (Winner Markus Brenneke). Then Douarnenez in May (Andy Beadsworth), followed by Dragor in June (Pieter Heerema). Finally San Remo in Sept (Again! Pieter Heerema).